We are a video production company based in Manchester and every now and again we get a new project where we want to try and do something a little bit different to our previous work: to please a client and also to keep ourselves developing new skills and techniques. 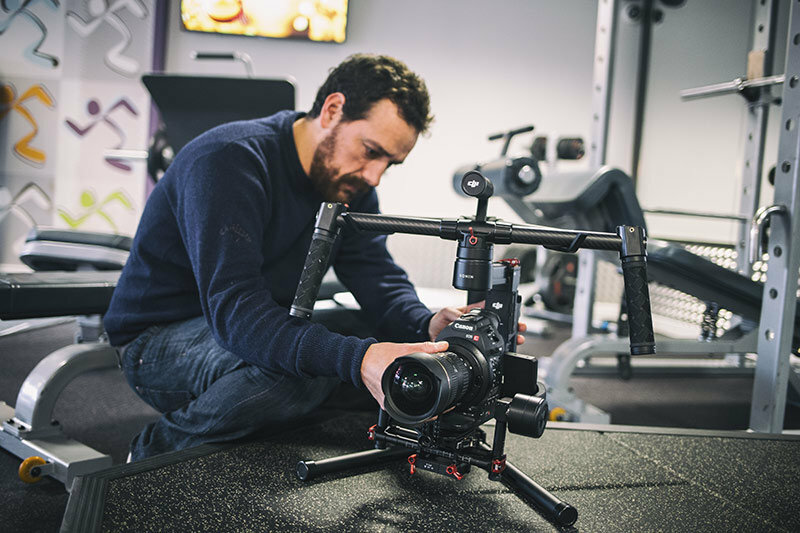 This happened most recently when in December 2016 we were asked to produce three videos for Anytime Fitness to showcase three of their newest gyms in Cheshire, England. Adding movement to my camera work has been something I’ve always looked for: in utilising sliders and cranes in my corporate work, but even when I was just starting out as a camera operator in Manchester and I stumbled across an online thread for a Poor man’s Steadicam for only $14, I knew instantly that I wanted to join the poor man’s Steadicam club! Was it good? Well, it was sort of steady at times. I used a Canon XH-A1 back in those days which was not a light camera, but you could get some usable footage with it, not much more than that really. However, the home-made Steadicam dream came to an end one day when I turned up to film a wedding and during the reception a guest referred to the videographer as ‘the plumber’. Oh. Well, maybe a DIY Steadicam wasn’t that great an idea for a professional after all? The DIY Steadicam was thankfully many years ago, and up until recently we’ve been using the Glidecam HD-2000, which although it is possible to get some pretty awesome shots every now and again with, in the end (even with only a DSLR on top) it’s a heavy gadget that you pretty much control with only one hand. It gets pretty tiring after a while and, although a definite improvement on the plumber’s Steadicam, when comparing the footage with that shot using other (and yes more expensive) Steadicam alternatives it became pretty obvious that something new was needed if we really wanted to achieve those smooth, moving shots we’d seen and loved so much. Looking around online and speaking to contacts at the time, we started to see and hear many good things regarding the Freefly MoVI and the DJI Ronin and Ronin-M. We’d worked with some DJI Phantom drones before and were delighted with the resulting footage, and when one of our regular freelance camera operators acquired a DJI Ronin-M himself, and we saw the results – and the reasonable price – we decided to dive right in ourselves and get one for Viva La Zoom. Straight out of the box anyone who’s put together anything by Meccano or Ikea flat-packing can piece together the parts with the help of the relatively basic instructions. However, we found that taking the instructions too literally stumped us a little. When we read that ‘prior to starting the Ronin-M, the camera has to be balanced in all its AXIS’, so we set about trying to balance one of our Canon C100s with a heavy, yet wonderful, Tokina 16-28mm lens. We tightened the tabs and sliding camera mounts, and tried to get the camera to balance its own weight on the gimbal, yet every time the camera would just flop lens first towards the floor. 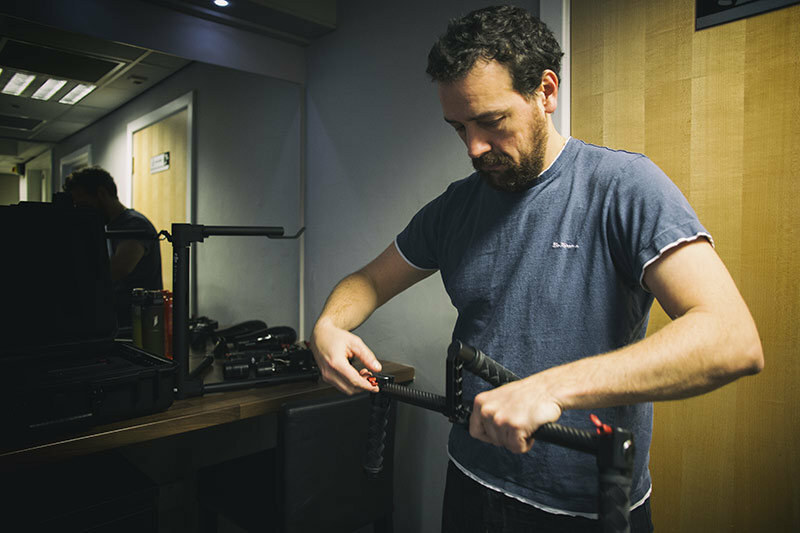 Luckily the Ronin-M comes with a stand so no damage caused, yet as we spent many a minute adjusting the plates on the gimbal millimetre by millimetre the damn thing would fall every single time. Disappointed? Naïve more like it. Out of frustration one of us just pressed the big red ‘on’ button. And guess what? The gimbal shot into life and balanced the camera instantly. Lesson number one: don’t overanalyse and oversubscribe to the instructions; instead just put the camera on and press the on button. As we don’t a camera monitor yet, we had to use the C100 own LCD screen…not the most ideal solution!! Having used the DJI Phantom and DJI Osmo in the past I’d had experience with DJI apps, and to be honest I wasn’t full of excitement in using the app with the Ronin-M. I hate depending on an app when you are out and about and the pressure is on with customers watching you use all your new and expensive camera gear, and then you have to rely on the stability of a free app, the stability of your phone and, of course, phone’s battery life. Personally, I’d prefer a simple small remote to come with the Ronin-M that does all the features of the app. The DJI Ronin assistant app is not the most intuitive and it crashes all the time! Now into the real heart of the review: straight from the start the Ronin-M really is a pleasure to use. It’s smooth and produces incredible footage, way better than any other system we had in the past (certainly better than the poor man’s Steadicam – RIP). I guess one of the main things about a stabiliser system like this is that it’s always going to be heavy, especially on your back. On the whole: get used to it. Although it will depend on the setup you put on the Ronin-M, it can feel like a workout to use. Which may be no bad thing ;). Our usual setup includes a C100 with a chunky wide angle lens. We also tend to strip the camera of the audio bar and side handle as otherwise it wouldn’t fit within the Ronin-M. We know we certainly push the Ronin-M to its limits. The manual actually recommends only a DSLR type of camera with the Ronin-M, and although we haven’t had any problems with our setup, I think a C100 or a Sony FS5 is probably the limits the Ronin-M can take. I doubt you could place a FS7 or equivalent on it. Another thought that became very obvious after our first outing with the Ronin-M was the difficulty of monitoring your shots while using a C100. Sometimes you wont be able to see the screen at all, so you may be taking risks with your composition and potentially ruining your shots. For our next outing with the Ronin-M we’re looking into adding something like the Blackmagic Video Assist as not only would it help monitor but it also records to Pro-Res which is very handy, especially considering the low bitrate on the C100s footage. 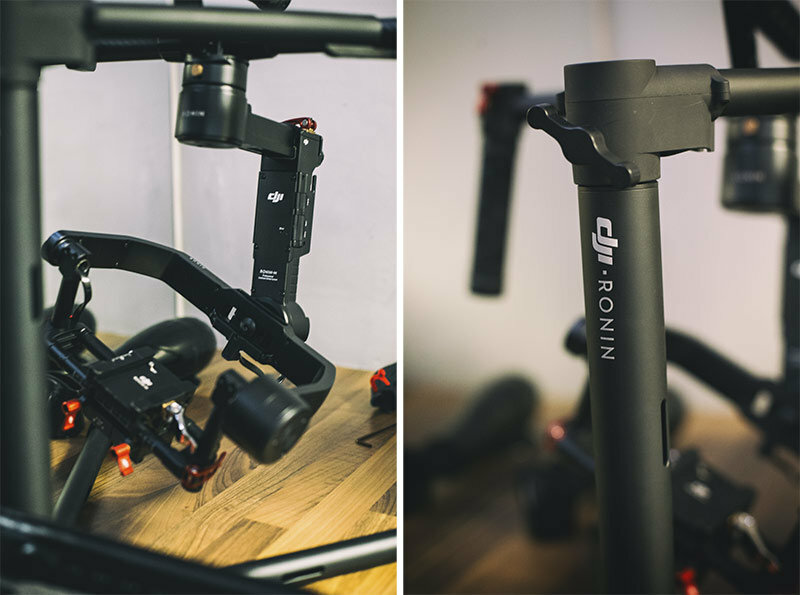 If you’ve tried the Ronin-M with the Video Assist please drop us a comment below and let us know how you found it! The C100 on a Ronin-M? The Canon C100 has been our workhorse camera for a couple of years now and we love it; however, we are on the verge of upgrading our cameras this year, but before doing so we’re waiting to see if Canon ups their game with something to rival the specs and price of the Sony FS5, or equivalent, or we may just have to let Mr. Sony take our cash. But that’s a subject for a whole different blog post in the future. At the moment, we don’t have something like the DJI Focus so we rely entirely on the Canon autofocus system, which is hit and miss as it focuses solely on the centre of the lens, or alternatively we just lock the focus at a set distance and plan our shots accordingly. Neither are ideal, but as we’re at the beginning of our Ronin-M journey we’re just testing the water with what works and what doesn’t for our own set-up and circumstances. One obvious difference between our previous poor man’s Steadicam and the Glidecam is that the Ronin-M uses battery powered gimbals. There is no doubt that these add a whole other level to the image stabilisation. There is no going back really once you’ve tried a gimbal operated camera stabiliser. 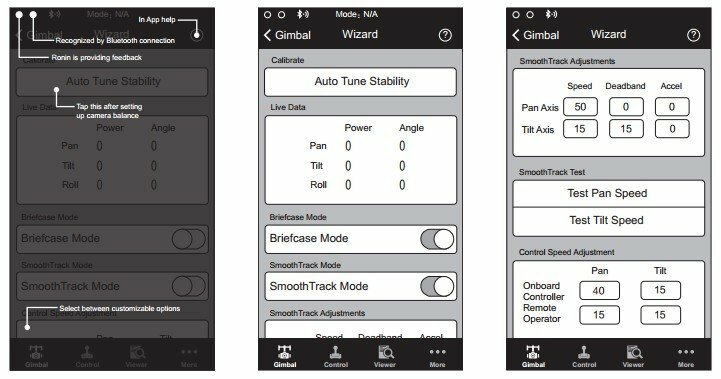 Having said that the obvious effect is that the more you use the gimbal the more you use the battery, so how long do they last and how many do you need? Well, we have two Ronin batteries and so far they’ve been enough, but that was due to our first project being indoors and having access to plug sockets to charge the battery we were not using. We found that one battery generally lasted a couple of hours of heavy usage. If you plan to be using the Ronin-M consistently throughout the day and you’re going to be outdoors I’d say three batteries is the bare minimum you should consider if you are of a cautious disposition. Choosing the right project – it’s not always right, is it? When it comes to these type of devices, it’s very easy to choose to do every video production project with a flying camera sort of style (especially when you just bought it! ), but as with any camera tool it’s often the less you use it the more impact it has. One of the reasons we decided to take the step to buy the Ronin-M is because we had a big promotional video project for a big american gym franchise: Anytime Gym. Straight from planning we felt that adding the fluidity of shots produced with a steady-cam would fit the project’s needs and ambitions: it would allows us to jump from the different areas of the physical space seamlessly, and as the subject matter is a gym, which is by nature a very active place, to have the camera moving at all times helped to define the subject. Did it work? Have a look and let us know! Anytime Fitness Knutsford from Viva La Zoom on Vimeo. As I said before, in terms of usage the Ronin-M is a pleasure to use and we now take it with us wherever we go, just in case we decide that movement would add to the video we’re making. 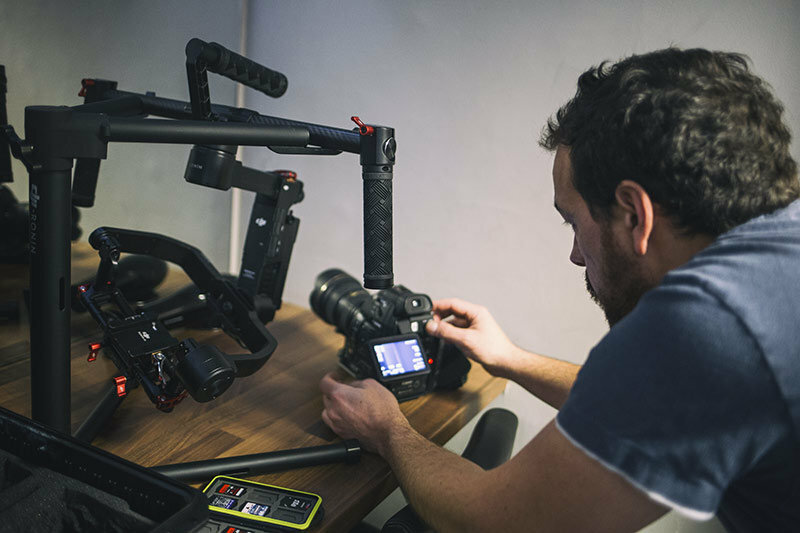 It takes a little while to get used to certain ways of working – like turning around or going up and down the stairs – but this is when experience becomes a valuable asset: the more you use and adjust your set-up, the better you find your resulting footage. The fluid, gliding shots we can now achieve with the Ronin-M are the kind of shots we’d been dreaming of including in our productions for a long time, and the only regret is that we didn’t splash the cash earlier and get it a year ago: live and learn, I guess. Once you’ve got something like the Ronin-M, or similar, in your arsenal it opens up new avenues of thinking; we’ve found that when planning future video projects our ideas have become less restrained and more liberated, not that we plan to use the Ronin-M on every project, but the fact that we now have the option to have fluid and, most importantly, stable camera movements in our productions we’re thinking differently in terms of storytelling and narrative. And now that we have this tool in our arsenal we find ourselves wondering how we ever got along without it.